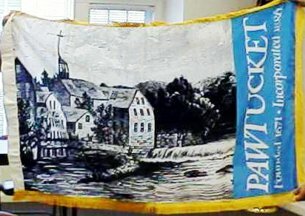 The flag consists of a printed illustration of building by a river, with a broad light blue band along the hoist stating PAWTUCKET and "Founded 1671 - Incorporated 1886"
Pawtucket is a city in Providence County, Rhode Island, United States. The population was 72,958 at the 2000 census. It is the 4th largest city in the state." - from Wikipedia: en.wikipedia.org/wiki/Pawtucket,_Rhode_Island, with more information about the city. The flag is shown on a photo here: www.psdri.net/WEBS/mrs_burns/ourtown.htm. Bigger photo: www.psdri.net/WEBS/mrs_burns/photos/pawtucketflag.jpg.